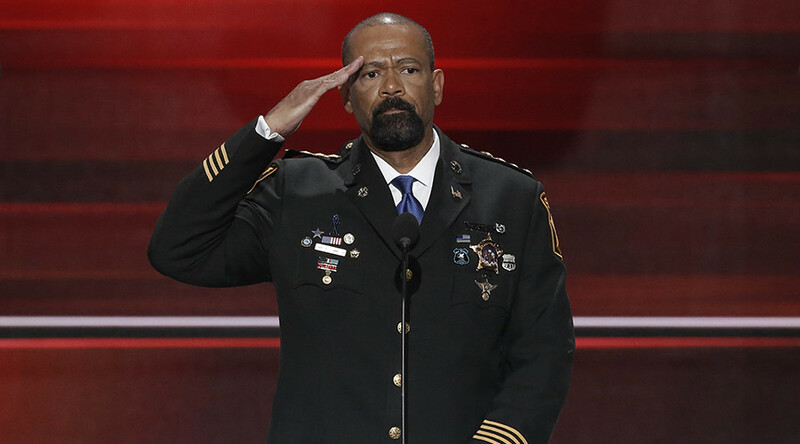 David A. Clarke Jr has resigned his post as sheriff of Milwaukee County, Wisconsin, according to the county clerk. Clarke has been a vocal supporter of President Donald Trump and has been rumored as a nominee for secretary of the US Department of Homeland Security. "Pursuant to Wisconsin Statute 17.01, this communication is submitted as the notice of my resignation as Sheriff of Milwaukee County commencing Aug. 31, 2017, at 11:59 p.m.," Clarke's resignation letter said, according to the Journal-Sentinel. Governor Scott Walker's spokesman, Tom Evenson, said that once he receives official notification of Clark's resignation, the governor will begin the process of finding a replacement, the Washington Post reported. Clarke was in Nashville, Tennessee for the National Fraternal Order of Police convention on Thursday, according to his Twitter account. He praised the organization for endorsing Trump during the 2016 election. He rose to national prominence as a fierce critic of the Black Lives Matter movement with his charged conservative rhetoric. Clarke was in his fourth term as sheriff. In a July 2016 op-ed for The Hill, Clarke wrote that a "civil war" was unfolding in the US. This after three Baton Rouge, Louisiana police officers were shot and killed. Clarke described "A war between rule of law and anarchy-seeking hate." In June of this year, Clarke reportedly withdrew his name from consideration for a role in the Department of Homeland Security. In May, a jury in Milwaukee recommended charges against seven county jail staffers over the death of an inmate who had his water shut off and never turned back on. No charges were recommended against Clarke, who oversaw the county jails. In January, after four inmate deaths in county jails, County Supervisor Supreme Moore Omokunde urged Clarke to resign. An investigation into Clarke launched by Milwaukee County auditors in January looked into a complaint that Clarke ordered his deputies to question a man who shook his head at the sheriff aboard an airplane. Clarke called the inquiry a "political witch hunt" and a "waste of time," WITI reported.